The Circuit setup is shown in figure 1 (without the line 2 input). A range of input Frequency from 10Hz to 100kHz to see the output voltage response. A range of AC input, from 500mV to 2V to observe the AC output to listen to the frequency. Transformer: 115Vac to 12Vac transformer is used. Voltage Regulator: The model for the Voltage Regulator is 7812, which gives an output voltage of 12V. 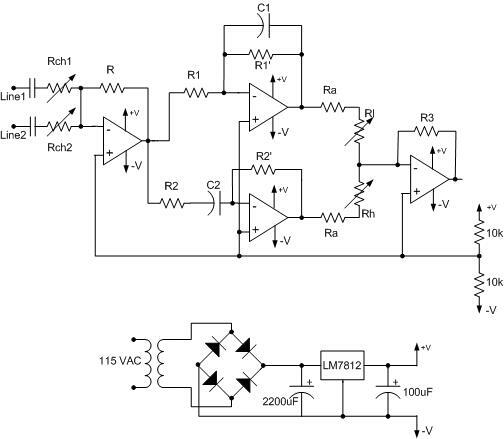 The output to the transfer function is not distorted by the changes made to this circuit. Therefore the output frequency response is the same as the frequency response recorded in lab7. Plot obtained from Lab07. Display here for convenience. The cutoff frequency for both the high pass and low pass filter is 5kHz. An valid input is the audio range.